Italy's most beloved city is yours to discover with our exclusive walking tours highlighting the exceptional art and architecture of the Renaissance capital. We also offer special tours for travelers interested in shopping, cooking, or Florence's unique Jewish history. Florence is home to some of the greatest architectural monuments in the world. The morning will be spent walking the streets of Florence discussing the art, architecture, history and folklore. 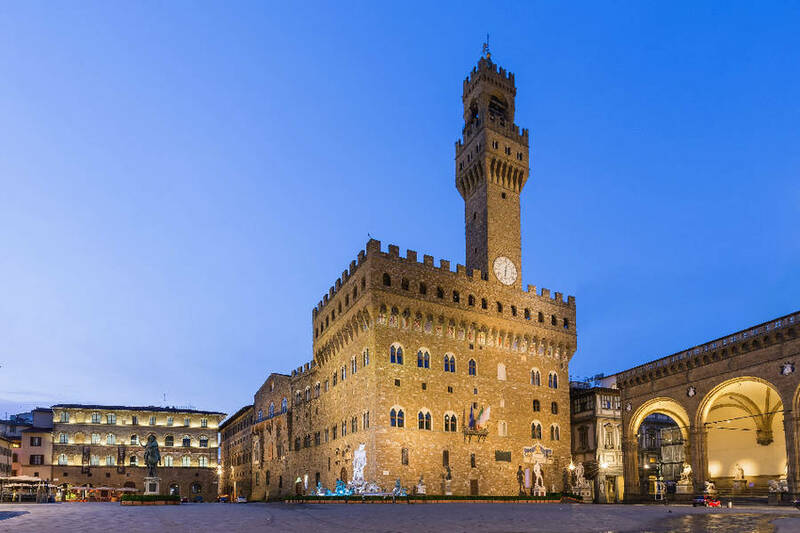 The tour will include visits to Brunelleschi's Duomo, the Church of Santa Croce, Palazzo Vecchio, Piazza della Signoria and the Ponte Vecchio. The Uffizi offers an unrivalled opportunity to see some of the greatest works of the Renaissance including masterpieces by Leonardo Da Vinci and Botticelli. Guests won't have to wait in line, but will enter with a reservation and tour the gallery's treasures with the help of an expert guide. You will be taken on a guided tour through the breathtaking Pitti Palace , once residence of the Medici family and considered one of Brunelleschi's greatest architectural accomplishments. Your expert guide will accompany you through the museum's majestic halls where you will view masterpieces by such artists asCanova, Titan, Raphael and Botticelli. Tour the Galleries, Costumes and Modern Art and conclude the morning with a walk through the hidden streets of the Oltrarno artisan quarter where you will get the rare opportunity to glimpse the artists at work in their workshops. Not available on the first or third Monday of the Month. Any two of the above itineraries may be combined for a full day tour of 6 hours. Experience individual, hands-on cooking lessons at a famous Florentine cooking school with expert chefs from the best restaurants in the city. Enjoy their personal and typical approach to Tuscan cuisine. Learn the secrets of Italian cooking in our Classic Italian Menu class, where you will be given the opportunity to choose a personalized menu consisting of Antipasto, Pasta, Entrée with side dishes and dessert. Students will enjoy the meal they have prepared, accompanied by the wines from the schools exclusive wine cellars. Morning or afternoon classes available to include lunch or dinner; please specify preference. This multi-faceted course includes an introduction to the Italian Language for Survival that teaches the basics of how to get by while travelling in Italy. This is followed by a Wine Appreciation Class with an expert sommelier who will introduce you to some of the most important wines from all over Italy, and finally, the Classic Italian Menu cooking class described above with lunch or dinner included: please specify preference. This unique tour includes the Synagogue and Museum which was originally built in 1882 and is one of the most important examples of a monumental temple in the Byzantine style with a Moorish influence. You will be astounded by the rich interior with lacy carvings in wood and bronze , the inlaid marble floors, the rich mosaics and the stained glass windows. Your guide will explain the building's history and will lead you through the museum housed within. You will then head out for a walking tour of Florence accompanied by your expert guide who will explain in passing the historical Jewish sites such as what was once the Jewish Ghetto, and is now the Center of the city of Florence. You will trace the history of such places as Piazza della Repubblica, Santa Croce, Piazza. Signoria and the David, Via Brunelleschi and Via de' Pecori while your guide elaborates on their importance in the historical context of the city. Why pay retail prices for your favourite Italian brand names such as Prada, Gucci, Cavalli, Fendi, Armani and much more? Depart Florence with your own personal driver for a half or full day of shopping. Unless otherwise indicated, all our tours begin at 9 am from the client's hotel. Ask about our Custom Art and Historical tours in Florence!